A certain proprietary software marketer stated in 2004 that by 2006 the spam and malware problems would be solved. This article explores what really happened, and presents evidence that the free software world we are in fact getting there fast and having fun at the same time. We offer an overview of principles and tools with real life examples and data, and cover the almost-parallel evolution of malware and spam and effective counter-measures. We present recent empirical data interspersed with examples of practical approaches to ensuring a productive, malware and spam free environment for your colleagues and yourself, using free tools. The evolution of content scanning is described and contrasted with other methods based on miscreants' (and their robot helpers') behavior, concluding with a discussing of recent advances in greylisting and greytrapping with an emphasis on those methods' relatively modest resource demands. In this article we will be talking about several varieties of the mostly mass produced nuisances we as network admins need to deal with every day. However, you only need to pick up an IT industry newspaper or magazine or go to an IT subject web site to see that there is a lot of confusion over terms such as virus, malware and for that matter spam. Even if a large segment of the so called security industry does not appear to put a very high value on precision, we will for the sake of clarity spend a few moments defining the parameters of what we are talking about. Malware or Malicious Software is software designed to infiltrate or damage a computer system without the owner's informed consent. A computer virus is a self-replicating computer program written to alter the way a computer operates, without the permission or knowledge of the user. The term zombie is frequently used to describe computers which are under remote control after a successful malware or manual attack by miscreants. You will notice that I have left out some parts at the end here, but if you're interested, you can look up the full versions at Wikipedia. And of course, if you read on, much of the relevant information will be presented here anyway, if possibly in a slightly different style and supplemented with a few other items, some even of distinct practical value. But first, we need to dive into the past in order to better understand the background of the problems we are trying to solve or at least keep reasonably contained on a daily basis. According to the Wikipedia 'Computer Virus' article, the first computer virus to be found in the wild, outside of research laboratories, was the 1982 "elk cloner" written by Rich Skrenta, then a teenager in Southern California. The virus was apparently non-destructive, its main purpose was to annoy Skrenta's friends into returning borrowed floppy disks to him. The code ran on Apple II machines and attached itself to the Apple DOS system files. Apple DOS and its single user successors such as MacOS up to System 9 saw occasional virus activity over the following years, much like the other personal systems of the era which all had limited or no security features built into the system. It took a few years for the PC world to catch up. The earliest virus code for PCs to be found in the wild was a piece of software called (c)Brain, which was written and spread all over the world in 1986. (c)Brain attached itself to the boot sector on floppies. In contrast to quite a number of PC malware variants to follow, this particular virus was not particularly destructive beyond the damage done by altering the boot sectors. Like most of the popular personal computer systems of the era, MS-DOS had essentially no security features whatsoever. In retrospect it was probably inevitable that PC malware blossomed into a major problem. To this day a large part of the PC based IT sector remains dedicated to writing malware and producing ever more elaborate workarounds for the basic failures of the MS-DOS system and its descendants. Current virus lists typically contain signatures for several hundred thousands of variants of mainly PC malware. Meanwhile in the Unix world, with its better connected and relatively well educated user base, things were relatively peaceful, at least for a while. The peace was more or less shattered on November 2, 1988 when the first Unix worm, dubbed the Morris worm hit Unix machines on the early Internet. This was both the first replicating worm in a Unix environment and the first example of a worm which used the network to propagate. More than 20 years later, there is still an amazing amount of information on the worm available on the net, including what appears to be the complete source code to the worm itself and a number of analyses by highly competent people. It's all within easy reach from your favourite search engine, so I'll limit myself to repeating the main points. Some of the Morris worm's characteristics will be familiar. It was system specific Even though there are indications that the worm was intended to run on more architectures, it was in fact only able to run successfully on VAXes and sun3 machines running BSD. It exploited bugs and sloppiness Like pretty much all of its successors, the Morris worm exploited bugs in common programs, such as a buffer overflow in fingerd, used the commonly enabled debug mode in sendmail - which allowed remote execution of commands - along with a short dictionary of likely passwords. It replicated and spread Once the worm got in, it started the process of spreading. Fortunately, the worm was designed mainly to spread, not to do any damage. It lead to denial of service Unfortunately, the worm code itself had a bug which made it more efficient at spreading itself than its author had anticipated, and caused a large increase in network traffic, slowing down Internet traffic to a large number of hosts. Some hosts worked around the problem by disconnecting themselves from the Internet temporarily. In one sense, it may have been one of the earliest Denial of Service incidents recorded. The worm was estimated to have reached rougly 10% of the hosts connected to the Internet at the time, and the most commonly quoted estimate of an absolute number is "around 6,000 hosts". The event was quite stressful for, by today's standards, a very small group of people. In retrospect, it is probably fair to say that the episode mainly served to make Unixers in general aware that there was a potential for security problems, and developers and sysadmins set out to fix the problems. The final components to form the current mess arrived on the scene in the second part of the 1990s when Microsoft introduced modern networking components to the default setup of their PC system software which came preinstalled on consumer grade computers. This happened at roughly the same time that several office type applications started shipping with their own fairly complete programming environments for macro languages. Riding on the coattails of the early 1990s commercialization of the Internet, Microsoft started real efforts to interface with the Internet in the mid 1990s. Up until some time in 1995, Internet connectivity was an optional extra to Microsoft users, mainly through third party stacks and frequently through hard to configure dial-up connections. Like the third party offerings, Microsoft's own TCP/IP stack was an optional extra -- downloadable at no charge, but not installed by default until late editions of Windows 3.11 started shipping with the TCP/IP stack installed by default. However, the all-out assault and their as good as claims to have invented the whole thing came only after a largely failed attempt at getting all Windows 95 users to sign up to the all-proprietary, closed-spec, dial-in Microsoft Network, which was in fact the first to use the name and the MSN abbreviation. The original Microsoft Network service did have some limited Internet connectivity; anecdotal evidence indicates that simple email transmissions to Internet users and back could take several days each way. As luck or misfortune would have it, by the time Microsoft's Internet adventure started, several of their applications had been extended to include application macro programming languages which were pretty complete programming environments. In retrospect we can confidently state that malware writers adapted more quickly to the changed circumstances than Microsoft did. The combination of network connectivity, powerful macro languages and applications which were network aware on one level but had not really incorporated any important security concepts and, of course, the sheer number of targets available proved quite impossible to resist. The late 1990s and early 2000s saw a steady stream of network enabled malware on the Microsoft platform, sometimes with several new variants each day, and never more than a few weeks apart. A semi-random sampling of the more spectacular ones include Melissa, ILOVEYOU, Sobig, Code red, Slammer and others; some were quite destructive, while others were simply very efficient at spreading their payload. They all exploited bugs and common misconfigurations much like the Morris worm had done a decade or more earlier. Greg Lehey's June 2000 notes on one of the more pervasive worms is still worth reading. (See Greg Lehey: Seen it all before?, Daemon's Advocate, The Daemon News ezine, June 2000 edition) The description is one of many indications that by 2000, malware writers had learned to mine the data in their victims' mail boxes and contact lists for useful data. During the same few years, Microsoft's stance also developed somewhat. Their traditional response had been We do not have bugs, then moved gradually to releasing patches and 'hot fixes' at an ever increasing rate, and finally moving to a regime of a monthly “Patch Tuesday” in order introduce some predictability to their customers' workday. Back in the day, the malicious and destructive software got all the attention. From time to time a virus, worm or other malware would grab headlines for destroying people's systems, in one case even overwriting system BIOSes of a common variety of PCs. I have no real numbers to back this up, but one likely theory is that during the early years malware writers may have been mainly youthful pranksters and the odd academic, and getting attention may have been the main motivator. In contrast, modern malware tries to take over your system without doing any damage a user or less attentive system administrator would notice. Typical malware today delivers its payload which then proceeds to take control of your computer - turning it into a zombie, usually to send spam, to infect other computers, or to perform any function the malware writer's customer needs to be done by remote control. There is ample evidence that once machines are taken over, installed malware is likely to record users' keystrokes, mine the file systems for financial and identification data, and of course any sort of remote controlled network activity such as participation in attacks on specific networks. There is also anecdotal evidence to suggest that a significant subset of online casino players are in fact remote controlled game playing robots running on compromised computers. The first spam message sent is usually considered to be a message sent via ARPANET email in 1978, from a marketing representative at the Digital Equipment Corporation's Marlboro site. Acccording to much repeated anecdotes the message was sent to "every Arpanet address on the west coast" of the USA. (See Reflections on the 25th Anniversary of Spam, by Brad Templeton). The message announced a demo of the then new and exciting DEC20 line of computers and the TOPS-20 operating system, and like many of its successors showed signs of sender's incompetence - the list of intended recipients was longer than the mail application was able to accept, and the list overflowed into the message itself. The message was well intended, but the reaction was overwhelmingly negative, and unsolicited commercial messages appear to have been close to non-existent, at least by modern standards, for quite a while after this particular incident. The spam problem remained more or less a dormant, potential problem until the commercialization of the Internet started in the early 1990s. 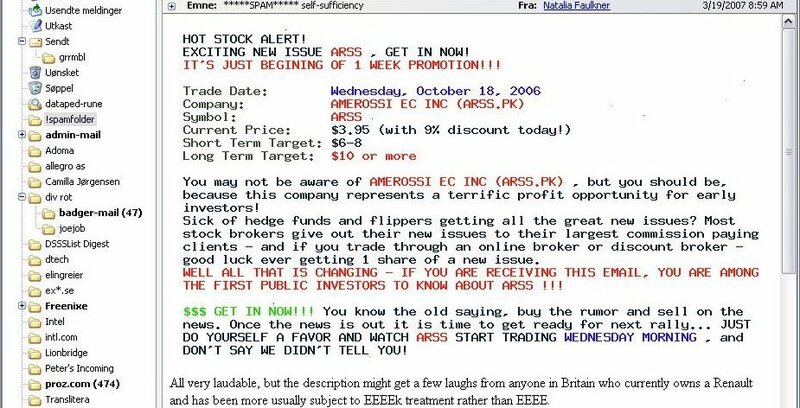 By then, email spam was still close to non-existent, but unsolicited commercial messages had started appearing on the USENET news discussion groups. In 1994, there were several incidents involving messages posted to all news groups the originators were able to reach. The first incident, in January, involved a religious message, followed a few weeks later by message hawking the services of a US law firm. At the time this would have meant that several thousand unrelated discussion groups received the same message, crossposted or repeated. The spam problem is sometimes cited as a major part of the reason why USENET declined in readership in favor of web forums, but in fact the USENET spam problem was largely solved within an impressively short time. Counter measures by USENET admins, including USENET Death Penalty (kicking a site off the USENET), cancelbots (automatic cancelling of articles which meet or exceed set criteria) and various semi-manual monitoring schemes were largely, if not totally effective in eliminating the spam problem. However, with an increasing Internet user population, the number of email users grew faster than the number of USENET users, and spammers largely turned their attention back to email towards the end of the 1990s. As we mentioned earlier, mass mailed messages were found to be effective carriers of malware. The two main characteristics of spam messages have traditionally been summed up as: A typical spam run consists of a large number of identical messages, and the content of the messages tend to form recognizable patterns. In addition, we will be looking at some characteristics of spammer and malware writer behavior. Even though we all wish we were perfect and never made any mistakes, it is a fact of life that even highly intelligent, well educated, mentally balanced and well disciplined people do occasionally make mistakes. The code audits, sometimes described as a process of reading the code like the Devil reads the Bible, concentrate on finding not only individual errors, but also recognizing patterns of the errors programmers make, and have turned up and eliminated whole classes of bugs in the source code audited. For more information on the goals and methods of these code audits, see the OpenBSD Project's Security page and Damien Miller's AsiaBSDCon 2007 presentation, available from the OpenBSD project's Papers and presentations page. The code audits also lead to the creation of a few exploit mitigation techniques, which are the subject of the next section. In several types of buffer overflow bug exploits, the exploit depends critically on the fact that in most architectures, the stack and consequently the buffer under attack starts at a fixed position in memory. Introducing a random-sized gap at the top of the stack means that jumping to the fixed address the attackers 'know' contains their code kills a large subset of these attacks. The buggy program is likely to crash early and often. Some bugs are possible to exploit because it is possible to have writable memory which is also executable. Implementing a sharp division involved some subtle surgery on how the binaries are constructed, with a slight performance hit. However, the performance was optimized back, and any attempts at writing to eXecutable memory will fail. Once again, buggy software fails early and often. One of the more ambitious bits of work in progress is to introduce randomization in mmap() and malloc(). Like the other features we have touched on here, it has been eminently useful in exposing bugs. Flaws which just lead to random instabilities or odd behavior are much more likely to break horribly with randomized memory allocation. One classic problem which has proved eminently exploitable is that programs have tended to run effectively as root, with more privileges than they actually need once they've bound themselves to the reserved port. Some simple programs were easy to rewrite to drop privileges and execute their main task with only the privileges actually needed. Other, larger daemons such as sshd needed to be split into several processes, some running in chroot, some bits retaining privileges, others running at minimum privilege levels. If it is not already obvious, one important effect of implementing these restrictions has been that these changes in the system environment has exposed bugs in a lot of software. For example, Mozilla's Firefox was for some time known to crash a lot more often on OpenBSD than almost anywhere else. However, the fixes for the exposed bugs tend to make it back into the various projects' main code bases. Virus scanners One of the first ideas security people hit upon when faced with files which could be carriers of something undesirable was to scan the files for specific kinds of content. Early content scanners were pure virus scanners which ran on MS-DOS and scanned local file systems for known bad content such as the byte sequences equal to known malware. Over time as the number of known bad sequences grew, the technology to do hashed lookups was introduced. At present the total number of known types of malware is estimated to exceed 200,000 signatures. Makers of most malware scanning products issue updates on an as needed basis, recently this means that they might issue several signature updates per day. Spam filters were at first close cousins to the bruteforce signature or substring lookup based virus packages. However, packages such as the freeware, Perl based SpamAssassin soon introduced rule based classification systems. The rule evaluation model SpamAssassin uses assigns weights to individual rules, allowing for site specific adjustments. Modern evaluation tools typically contain rules to evaluate both the message bodies and the message header information in order to determine the probability that a message is spam. Another feature of modern filtering systems is that they are either built around or employ as optional modules various statistics based classification methods such as Bayesian logic, the Chi-Square method, Geometric and Markovian Discrimination. The statistics based methods are generally customized via training, based on a corpus of spam and legitimate mail collected by the site or user. As the lists of signatures have grown to include an ever larger number of entries and have been supplemented with the more involved statistical calculations, content scanning has developed into one of the more resource intensive computations most of us will encounter. Even with such a formidable arsenal of tools at our disposal, it is important to keep in mind that all the methods we have mentioned have a nonzero error rate. Once you are done with setting up your filtering solution, you will find that care and feeding will include compensating for problems caused by various errors. Keyword lookup: Matching on specific words which were known to be more common in unwanted messages than others was one of the early successes of spam filtering software. The other side soon hit on the obvious workaround - misspelling those keywords slightly, for a short time shrouding the message behind the likes of V1AGR4 or pr0n. Again the countermeasures were fairly obvious; soon all content filtering products included regular expression substring match code to identify variations on the key words. Hidden in there is a very short sequence of characters which describes what they are trying to sell. At times we see messages which appear not to have any such payload, just the random text. It is not clear whether these messages are simply products of errors by inept spamware operators or, as some observers have speculated, if they are part of a larger scheme to distort the statistical basis for content scanners. 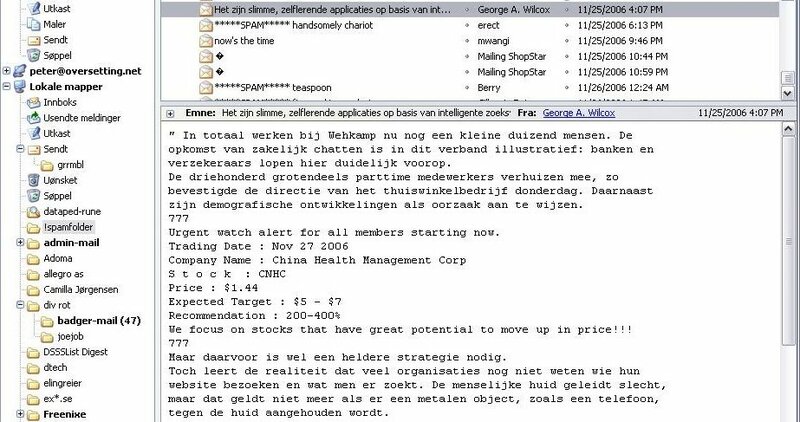 All of these examples were taken from messages I have received, the last one in November 2006 when the various tools were not yet perfectly tuned to get rid of those specific nuisances. Newer SpamAssassin plugins such as FuzzyOcr are making good progress in identifying these variants, at the cost of some processing power. The figure displays the main message content. The main message as well as the web site URL are rendered as ASCII art, followed by apparently random text. The message came with enough spam characteristics that filtering system awarded this particular message a spamassassin score of 8.3, well into the 'likely but not definitely spam' range. The sequence is certainly not unique, and we should probably expect to see similar mini arms races in the future. One obvious consequence of the ever-increasing complexity in content filtering is that mail handling, once a reasonably straightforward and undemanding activity, now requires serious number crunching capability. And it bears repeating that you should expect a non-zero error rate in content classification. Up to this point we have looked at what we can achieve first by making any bugs in our operating system or applications harder to exploit, and next what can be done by studying the content of the messages once we've received them or while our mail transfer agent is processing the DATA part. From what we have seen so far, it is fairly obvious that the other side is trying to hide their tracks and avoid detection. Spammers lie This shows even more clearly if we study their behavior on the network level. The often repeated phrase "Spammers lie, cheat and steal" at least to some extent proves to be rooted in reality when we study spam and malware traffic. Forged headers Spammers may or may not be truthful when describing the wares they are promoting, but we can be more or less certain that they do their very best to hide their real identities and use other people's equipment and resources whenever possible. Studying the message headers in a typical spam message, we can expect to find several classes of forged headers, including but not limited to the Received:, From: and X-Mailer: headers. Perhaps more often than not, the apparent sender as taken from the From: header has no connection whatsoever to the actual sender. Sender identification Some such discrepancies are easy to detect, such as when a message arrives from an IP address range radically different from the one you would expect when performing a reverse DNS lookup based on the stated sender domain. Traditional Internet standards do in fact not define a standard for determining whether a given host is a valid mail sender for a given domain. However, by 2003 work started on extensions to the SMTP protocol incorporating checks for domain versus IP address mismatches. After a sometimes confusing process with attempts at formalizing workable standards, these ideas were formalized into two competing and somewhat incompatible methods, dubbed Sender Policy Framework (SPF) and Sender ID respectively, one championed by a group of independent engineers and researchers, the other originating at Microsoft. The initial hope that the differences and incompatibilities would be resolved was further dashed in April 2006 when the two groups chose to formulate separate RFCs describing their experimental protocols (The relevant RFCs are RFC 4406 and RFC 4407 for the Microsoft method, which describe the Sender ID protocol and the Purported Responsible Address (PRA) algorithm it depends on respectively, and RFC 4408 for SPF.). The world fortunately chose SPF and moved on to further work involving signing outgoing messages (DKIM) and finally the umbrella specification DMARC which builds on SPF and DKIM and adds its own wrapper, all to be stuffed into DNS TXT records for the sender domain. Expect more rants along these lines from here to follow. Blacklists Once a message has been classified as spam, recording the IP address the message came from and adding the address to a list of known spam senders is a relatively straightforward operation. Such lists are commonly known as blacklists, which may in turn be used in blocking, tarpitting or filtering. Greylisting Possibly as a consequence of their using other people's equipment for sending their unwanted traffic, spam and malware sender software needs to be relatively lightweight, and frequently the SMTP sending software does not interpret SMTP status codes correctly. This can be used to our advantage, via a technique which became known as greylisting. Greylisting as a technique was presented in a 2003 paper by Evan Harris. The original Harris paper and a number of other useful articles and resources can be found at the greylisting.org web site. Even though Internet services are offered with no guarantees, usually described as 'best effort' services, a significant amount of effort has been put into making essential services such as SMTP email transmission fault tolerant, making the 'best effort' one with as close as does not matter to having a perfect record for delivering messages. But the main points still stand: After all, delivering email is a collaborative, best effort thing, and the RFC states clearly that if the site you are trying to send mail to reports it can't receive anything at the moment, it is your DUTY (a MUST requirement) to try again later, after an interval which is long enough that your unfortunate communication partner has had a chance to clear up whatever was the problem. The short version is, greylisting is the SMTP version of a white lie. When we claim to have a temporary local problem, the temporary local problem is really the equivalent of “my admin told me not to talk to strangers”. Well behaved senders with valid messages will come calling again later, but spammers have no interest in waiting around for the retry, since it would increase their cost of delivering the messages. This is the essence of why greylisting still works. And since it's really a matter of being slightly pedantic about following accepted standards, false positives are very rare. Greytrapping The so far final advance in spam fighting is greytrapping, a technique pioneered by Bob Beck and the OpenBSD team as part of the spamd almost-but-not-quite SMTP daemon. This technique makes good use of the fact that the address lists spammers routinely claim are verified as valid, deliverable addresses are in fact anything but. With a list of greytrap addresses which are not expected to receive valid mail, spamd adds IP addresses which try to deliver mail to the greytrap addresses to its local blacklist for 24 hours. Blacklisted addresses are then treated to the tarpit, where their SMTP dialog receives responses at a rate of one byte per second. The intention, and to a large extent the actual effect, is to shift the load back to the sender, keeping them occupied with a very slow SMTP dialogue. We will return to this in a later section. It is worth noting that products frequently use some combination of content scan and network behavior methods. For example, spamassassin incorporates rules which evaluate message header contents, using SPF data as a factor in determining a message's validity, while at the same time using locally generated bayesian token data to evaluate message contents. We have already touched on the danger of false positives and the main downside of content filtering, and it is worth noting the possible downsides and pitfalls which come with the behavior based methods too. The inner workings of proprietary tools are generally secret, but one particularly bizarre incident involving Microsoft's Exchange Hosted Services reveals at least some of the inner workings of that particular product. All available evidence indicates that their system treats substring match based on a phishing message to be a valid reason to block or “quarantine” messages from a domain, and that their data do not expire. The incident is chronicled by a still puzzled network administrator at this site. Header mismatches While most simple header mismatch checks are reliable, the one important criticism of SPF and Sender ID is that the schemes are incompatible with several types of valid message forwarding, another that the problem of roaming users on dynamic IP adresses who still need to send mail has yet to be solved. Blacklists The ways blacklists are generated, maintained and used are almost too numerous to list here. The main criticism and pitfalls lie in the way the lists are generated and maintained. Some lists have tended to include entire ISP networks' IP ranges as “know spam senders” in an attempt to force ISPs to cancel spammers' contracts. Another recurring complaint is that lists are less than actively maintained and may include out of date data. Both can lead to false positives and legitimate mail lost. Unfortunately, some popular blacklists have at times been abused and employed as instruments in personal vendettas. For those reasons, it always pays to check a list's maintenance policy and its reputation for accuracy before using a list as sufficent reason to reject mail. Greylisting Even valid senders will experience a delay in delivery of the initial message. The length of the delay varies according to a number of factors, some of which are not under the greylister's control. A more serious issue is that some large sites do not necessarily perform the delivery retries from the same IP address as the one used for the initial attempt. A large enough pool of possible sending hosts and a sufficiently random retry pattern could lead to delivery timeout. Whitelisting the sites in question may be a temporary workaround, however with greylisting entering the mainstream it is expected that the problem of random redelivery will decrease and hopefully disappear entirely. Greytrapping The only known risk of using greytrapping to date is that the backscatter of “message undeliverable” bounce messages resulting from spam messages sent with one of your trap addresses as apparent sender may cause mail servers configured to send nondelivery messages to enter your blacklist. This will cause loss or delayed delivery of valid mail if the backscattering mail server needs to deliver valid mail to your site. How often, if at all, this happens depends on several semi-random factors, including the configuration policies of the other sites' mail servers. Unix sysadmins find themselves in an inbetween position of sorts. We can never totally rule out that our systems are vulnerable, but malware which will actually manage to exploit a well run UNIX system is rarely seen in the wild, if at all. A well run system means that best practice procedures are applied to system administration: we do not run unneccessary services, we install any security related updates, we enforce password policies and so on. However, we more likely than not run services for users who run their main environment on vulnerable platforms. Malware for the vulnerable platforms more likely than not spreads via email, which is quite likely one of the services we handle. We'll take a look at email handling, then move on to some productive uses of packet filtering (aka firewalls) later. BSDs generally come with sendmail as part of the base system. For our sites we have chosen to use exim for several reasons. Despite its human readable configuration files, it offers enormous flexibility, and on FreeBSD users will find that the package message offers a screenful of help to configure your mail service to do spam and malware filtering during message receipt. The main point is that your mail transfer agent needs to be able to cooperate with external programs for filtering. Most modern MTAs do; the other popular choices are postfix or sendmail, and in recent times, OpenSMTPd which is developed as part of the OpenBSD project, is showing great promise. All the early greylisting implementations and several of the options in use today were written as optional modules for mail transfer agents. If, for example, you will not be using PF anywhere, using spamd (which we will be covering in more detail later) is not really an option, and you may want to go for and in-MTA option, such as a sendmail milter such as greylist-milter or a postfix policy server such as postgrey. In some environments, the initial delay in delivery of the first message may be undesirable or downright unacceptable; in such cases, the option of greylisting is unfortunately off the table. There are a number of malware scanners available, some free, some proprietary. The favorite seems to be the one we chose, clamav. clamav is GPL licensed and conveniently available through the package system on your favourite BSD. The product appears to be actively maintained with frequent updates of both the code itself and the malware signature database. Once it is installed and configured, clamav takes care of fetching the data it needs. Signature database update frequency appears to be on par with competing commercial and proprietary offerings. Spam filtering is another well populated category in the BSD package systems. Several of the free offerings such as dspam and spamassassin are very complete filtering solutions, and with a little care it is even possible to combine several different systems in a sort of cooperative whole. We chose a slightly simpler approach and set up a configuration where messages are evaluated by spamassassin during message receipt. spamassassin is written mainly in perl, shepherded by a very active development team and is very flexible with all the customizability you could wish for. 2007-04-08 02:39:35 1HaLRE-000Kq0-3P => blackhole (DATA ACL discarded recipients): Your message scored 116.0 Spamassassin points and will not be delivered. Clearly not spam A large number of rules are in play, and for various reasons valid messages may match one or several of the rules. We chose a definitely not spam limit which means that messages which accumulate 5 spamassasin points or less are passed with only a X-Spam-Score: header inserted. Mainly for the administrator's benefit, a detailed report of which rules were matched and the resulting scores is included in the message headers. This means you have real data to work with for any fine tuning you need to do in your local customization files, and for valid senders who for some reason trigger too many spam characteristics, you may even whitelist using regular expression rules. Optional spamassassin plugins even offer the possibility of automated feedback to hashlist sites such as Razor, Pyzor and DCC - a few scripts will go a long way, and the spamassassin documentation is in fact quite usable. Performing content scanning during message receipt means you run the risk of having mail delivery to your users stop if one of your content scanner services should happen to crash. For that reason it can be argued that since content scanning, as opposed to greylisting, does not have to be performed during message receipt, it should be performed later. Server or end user processes can for example be set up to do filtering on user mail boxes, using tools such as procmail or even filtering features built into common mail clients such as Mozilla Thunderbird or Evolution. Now of course all of this content scanning adds up to rather extensive calculations, well into what we until quite recently would have considered “serious number crunching”. The next section will present some recent advances which most likely will lighten the load on your mail handlers. As content filtering grew ever more expensive, several groups started looking into how to shift the burden from the recipient side back to the spammers. The OpenBSD project's spamd is one such effort which is inteded to integrate with OpenBSD's PF packet filter. Both PF and spamd have been ported to other BSDs, but here we will focus on how spamd works on OpenBSD in the present version. The initial version of spamd was introduced in OpenBSD 3.3, released in May 2003. The basic idea was to have a basic tarpitting daemon which would produce extremely slow SMTP replies to hosts in a blacklist of known spammers. Known spammers would have their SMTP dialog dragged on for as long as possible, where the spamd at our end would serve its part of the SMTP dialog at a rate of one byte per second. Here the table definitions denote lists of addresses, <spamd> to store the blacklist, while the addresses in <spamd-white> are not redirected. (See eg this article for a more recent configuration example - details of how spamd works has changed over the years). Note: Since this was originally written, the uatraps list was unfortunately retired from service and is no longer available. See the update notes at the end of the article for some more information. Updates to the lists are handled via the spamd-setup program, run at intervals via cron. 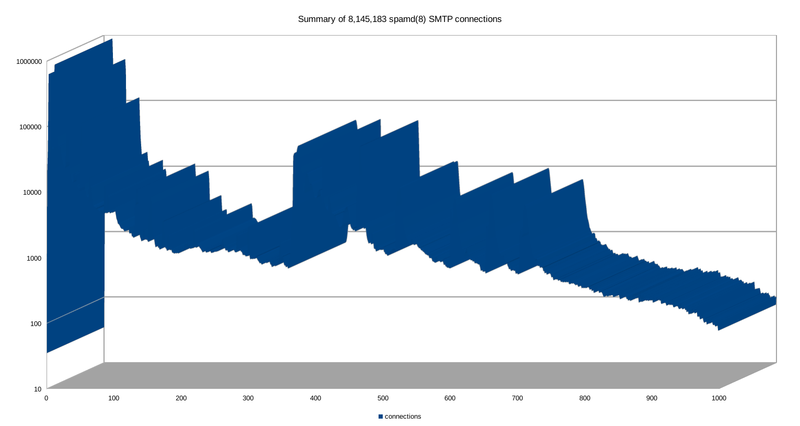 spamd in pure blacklisting mode was apparently effective in wasting known spam senders' time, to the extent that logs started showing a sharp increase in the number of SMTP connections dropped during the first few seconds. Inspired by the early in-MTA greylisters (see the discussion of greylisting earlier), spamd was enhanced to include greylisting functions in OpenBSD 3.5, which was released in May 2004. The result was a further reduction in load on the content filtering mail handlers, and OpenBSD users and developers have found spamd's greylisting to be so effective that from OpenBSD 4.1 on, spamd greylists by default. Pure blacklisting mode is still available, but requires specific configuration options to be set. Oct  2 20:00:05 delilah spamd: 65.210.185.131: disconnected after 404 seconds. Here we see how hosts connect for 0 or more seconds to be greylisted, while the blacklisted host gets stuck for 404 seconds, which is roughly the time it takes to exchange the typical SMTP dialog one byte at the time up to the DATA part starts and the message is rejected back to the sender's queue. It is worth noting that spamd by default greets new correspondents one byte at the time for the first ten seconds before sending the full 451 temporary failure message. 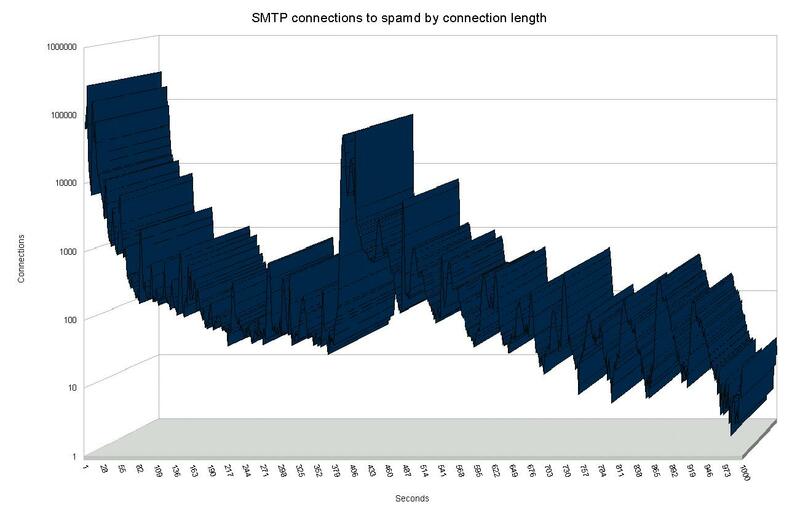 The graph below is based on data from one of our greylisting spamd gateways, illustrating clearly that the vast number of connection attempts are dropped within the first ten seconds. The next peak, in the approximately 400 seconds range, represents blacklisted hosts which get stuck in the one byte at the time tarpit. The data in fact includes a wider range of connection lengths than what is covered here, however, the frequency of any connection length significantly longer than approximately 500 seconds is too low to graph usefully. The extremes include hosts which appear to have been stuck for several hours, with the outlier at 42,673 seconds, which is very close to a full 12 hours. Users and administrators at sites which implement greylisting tend to agree that they get rid of most of their spam that way. However, real world data which show with any reasonable accuracy the size of the effect are very hard to come by. People tend to just move along, or maybe their frame of reference changes. For that reason it was very refreshing to see a message with new data appear on the OpenBSD-misc mailing list on October 20, 2006 (See Steve Williams' October 20th, 2006 message to the OpenBSD-misc mailing list). In that message, Steve Williams describes a setting where the company mail service runs on Microsoft Exchange, with the malware and spam filtering handled by a Mcafee Webshield appliance. During a typical day at the site, Williams states, "If we received 10,000 emails, our Webshield would have trapped over 20,000 spam" - roughly a two to one ratio in favor of unwanted messages. The appliance was however handling spam and malware with a high degree of accuracy. That is, it was doing well until a new virus appeared, which the Webshield did not handle, and Williams' users was once again flooded with unwanted messages. Putting an OpenBSD machine with a purely greylisting spamd configuration in front of the Webshield appliance had dramatic effects. Running overnight, the Webshield appliance had caught a total of 191 spam messages, all correctly classified. In addition, approximately 4,200 legitimate email messages had been processed, and the spamd maintained whitelist had reached a size of rougly 700 hosts. By the metrics given at the start of Williams' message, he concludes that under normal circumstances, the unprotected appliance would have had to deal with approximately 9,000 spam or malware messages. In turn this means that the greylisting eliminated approximately 95% of the spam before it reached the content filtering appliance. This is in itself a telling indicator of the relative merits of enumerating badness versus behavior based detection. By the time the development cycle for OpenBSD 3.8 started during the first half of 2005, spamd users and developers had accumulated significant amounts of data and experience on spammer behaviour and spammer reactions to countermeasures. We already know that spam senders rarely use a fully compliant SMTP implementation to send their messages. That's why greylisting works. Also, as we noted earlier, not only do spammers send large numbers of messages, they rarely check that the addresses they feed to their hijacked machines are actually deliverable. Combine these facts, and you see that if a greylisted machine tries to send a message to an invalid address in your domain, there is a significant probability that the message is a spam, or for that matter, malware. Consequently, spamd had to learn greytrapping. Greytrapping as implemented in spamd puts offenders in a temporary blacklist, dubbed spamd-greytrap, for 24 hours. Twenty-four hours is short enough to not cause serious disruption of legitimate traffic, since real SMTP implementations will keep trying to deliver for a few days at least. Experience from large scale implementations of the technique shows that it rarely if ever produces false positives, and machines which continue spamming after 24 hours will make it back to the tarpit soon enough. One prime example is Bob Beck's "ghosts of usenet postings past" based traplist, which rarely contains less than 20,000 entries. The reason we refer to it as a “traplist” is that the list is generated by greytrapping at the University of Alberta. At frequent intervals the content of the traplist is dumped to a file which is made available for download and can be used as a blacklist by other spamd users. The number of hosts varies widely and has been as high as almost 200,000. The peak number of 198,289 entries was registered on Monday, February 25th 2008, at 18:00 CET. 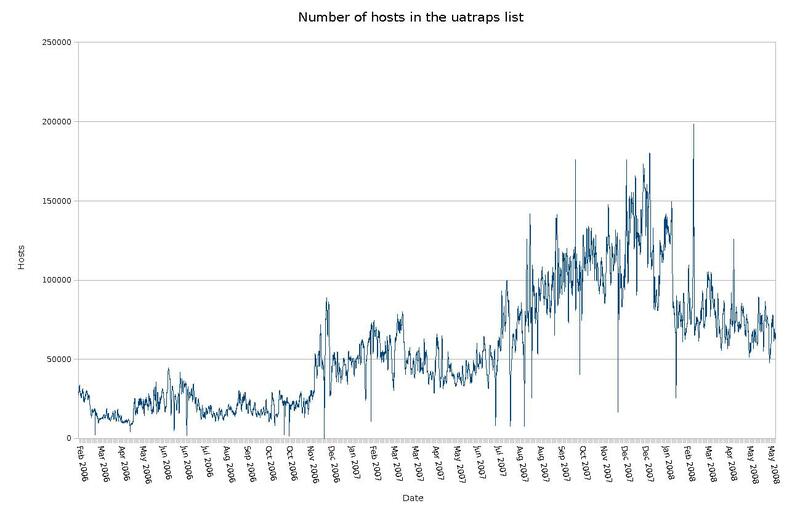 The diagram here illustrates the number of hosts in the list over a period of a little more than two years. At the time this article was originally written (mid March, 2008), the list typically contained around 100,000 entries. While still officially in testing, the list was made publicly available on January 30th, 2006. The list has to my knowledge yet to produce any false positives and was available from http://www.openbsd.org/spamd/traplist.gz. Setting up a local traplist to supplement your greylisting and other blacklists is very easy, and is straightforwardly described in the spamd and spamdb documentation. Anecdotal evidence suggests that a limited number of obviously bogus addresses such as those which have already been seen in spamd's greylisting logs or picked from Unknown user messages in your mail server logs will make a measurable dent in the number of unwanted messages which still make it through. Some limited ongoing experiments started in July 2007 (See the blog post http://bsdly.blogspot.com/2007/07/hey-spammer-heres-list-for-you.html and followups) indicate that publishing the list of greytrap addresses on the web has interesting effects. After a spike in undeliverable bounce messages to non-existent addresses, we began adding backscatter addresses in our own domains to the local greytrap list and publishing the greytrap addresses on a web page that was referenced with a moderately visible link on the target domains' home pages. The greytrap list quickly grew to several thousand entries (The list, with some accompanying explanation, is maintained at bsdly.net, fed by what appears to be several different address generating operations with slighly different algorithms and patterns). See the field notes at http://bsdly.blogspot.com/2007/11/i-must-be-living-in-parallel-universe.html for some samples. Addresses would typically start to appear in our greylist dumps (and occasionally in mail server logs) as intended recipients for messages with From: addresses other than <> within days of being added to the published list. The net effect of a sizeable list of published greytrap addresses is both a higher probability of detecting spam senders early and further worsening spammers' effective hit rate by lowering the quality of their address lists. One of the main overall characteristics of the changes implemented in the most recent OpenBSD release is that they tend to be what users and developers see as sensible, best practice compliant defaults. Typical of the sensible defaults theme is the decision to have spamd run in greylisting mode by default. This change was implemented in OpenBSD 4.1, released May 1st, 2007. Sites with several mail exchangers and corresponding spamd instances will appreciate the synchronization feature for greylisting databases between hosts, also an OpenBSD 4.1 improvement. Sites and domains with several mail exhangers with different priorities have seen that spammers frequently attempt to deliver to secondary mail exchangers first. As a consequence, the greytrapping feature was extended to detect and act on such out of order mail exchanger use. The main conclusions are that the free tools work, and that by using them intelligently you can actually make a difference. If our goal is to achieve relative peace and quiet in our own networks so we get our real work done, there are real advantages in stopping undesirable traffic as early as possible, and stopping most of it at the perimeter is actually doable. All the tools we have studied are open source. The open source model, which is closely related to the peer review style of development seen in academic research, produces effective, high quality tools which truly make your life easier. The often repeated argument that development in the open would make it easier for the other side to develop countermeasures does not match our experience. If anything we see that development in the open means that ideas get exposed to real world conditions quickly, exposing the less robust approaches in ways that closed development is apparently unable to match. The data I presented earlier as graphs seem to indicate that our efforts have some effect. There appears to be a trend which has the number of greytrapped hosts seemingly stabilize at a higher level over time. This could be taken as an indicator that the number of compromised machines is rising, but could equally well be interpreted to mean that spammers and malware senders need to try harder now that effective countermeasures are becoming more widely deployed. By studying our adversaries' behavior patterns we have trapped them, and we may just be starting to win. If you enjoyed this article, please consider buying OpenBSD merchandise or donating to the project either directly or via the OpenBSD Foundation. The uatraps greytrapping-based blacklist was unfortunately retired from service in May 2016 and is no longer available. My own bsdly list, which is another greytrapping-generated list stabilized at a slightly higher number of entries after uatraps dispappeared, and for that reason I chose to replace the uatraps reference with that one in a common example. Other good sources of information is the example spamd.conf in your /etc/mail directory if you're running OpenBSD. And if you want to explore a useful, if slightly unusual way to use routing protocols, take a look at Peter Hessler's BGP-spamd initiative. The OpenBSD-misc discussion also touched on expected connection lengths for the SMTP traffic spamd captures, and I realized I could possibly shed some further light on the issue. The graph earlier in the article was based on logs covering approximately 1 million connections. Even with slightly different log rotation settings between them, the still existing logs on the three gateways described in the Voicemail Scammers piece between them contained data on some 8,145,183 connections, graphed below. That is, like I did with the earlier graph I chose to limit the data to the 0 to 1,000 seconds interval. The general pattern seems to be unchanged: The vast majority of the connections drop during the first few seconds, but the data includes some outliers, all the way out to the one that hung on for a whole 63423 seconds (17 hours, 37 minutes and 3 seconds). Which of course makes the full data impossible to graph. Click on the image to get the raw size, and if you like you can download the spreadsheet or the CSV version. The full data runs into the gigabytes, but if you want to take a peek for research purposes, please contact me via the various conventional means. Update 2016-12-14: Added a paragraph mentioning DKIM and DMARC, which were either preliminary specifications or not yet thought up at the time this was originally written.